National Dance Week will soon return on April 19-28. Many studios and dance programs across America are gearing up to celebrate. One of these is The Marblehead School of Ballet (MSB) in Massachusetts. To thank the public for its support for 47 years, MSB will offer special discounts from Friday, April 19 through Saturday, April 27. It will also present a preview performance of new works in progress. According to Shiff, this is the time to try something different or revisit a dance style you want to further explore. “During National Dance Week, new students may attend a class for only $5 with advanced registration, or they may watch a class and learn about the school's dance events and activities taking place throughout the year,” explained Shiff. Students currently enrolled in the school may bring a friend to a class for the reduced fee of $5. They may attend classes in ballet, Barre, stretch and strength, creative movement, ballroom, Argentine tango, swing, salsa and more. Newcomers to the school are invited to arrange a complimentary consultation with Shiff to discuss their dance future. For a class schedule, information about private lessons and other details, call 781-631-6262, send an e-mail to msb@havetodance.com or visit the organization's website at www.marbleheadschoolofballet.com. Then the community is invited to see a sneak peak of new modern dance works at the studio, located at 115 Pleasant Street in Marblehead, on Saturday, April 27 at 2 p.m. NSCB dancers Alex Berg and Nica Mele will perform two original pieces, Celeste and Zuhandenheit, both choreographed by Ivan Korn. Celeste, inspired by Radio Tarifa's music, revolves around a summertime landscape, where time expands due to the length of the day. The impending end triggers a sense of anticipation. On the other hand, Korn described Zuhandenheit as a dance piece with “a combative edge”. For more information on MSB, NSCB or their National Dance Week festivities, head to www.marbleheadschoolofballet.com. Meanwhile, for others across the country, the National Dance Foundation encourages you to bring dance into your own local community for National Dance Week. The foundation suggests planning a dance mob and performing at a school, daycare or nursing home. For further ideas, head to www.nationaldancefoundation.org. 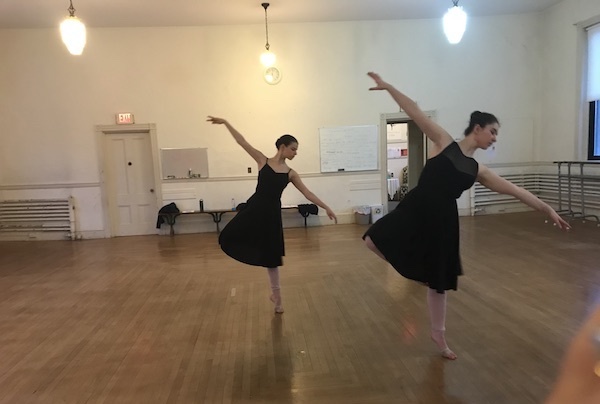 Photo: During National Dance Week, NSCB dancers Nica Mele and Alex Berg will perform Celeste and Zuhandenheit at the Marblehead School of Ballet. Photo courtesy of NSCB.